Story…..Ten-year-old Sophie is in for the adventure of a lifetime when she meets the Big Friendly Giant. Naturally scared at first, the young girl soon realizes that the 24-foot behemoth is actually quite gentle and charming. As their friendship grows, Sophie’s presence attracts the unwanted attention of Bloodbottler, Fleshlumpeater and other giants. 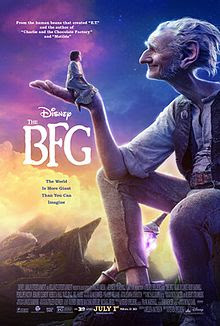 After traveling to London, Sophie and the BFG must convince Queen Elizabeth to help them get rid of all the bad giants once and for all.